DownloadHunter is the PUP that uses misleading techniques to prevent removal. Use Reimage to locate malicious components and get rid of them faster than with uninstall instructions. A full system scan blocks virus reappearance and prevents traffic to malicious domains. What is interesting about DownloadHunter virus? How frequently my web browser can deliver DownloadHunter ads? How can I remove this PUP from my computer entirely? 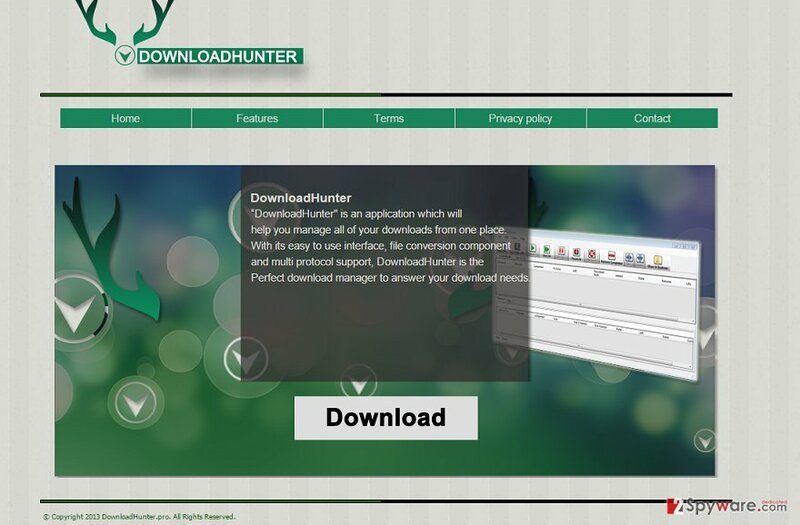 DownloadHunter is an application that boasts being able to “help you manage all of your downloads from one place.” Besides, it claims to feature smooth interface, have a built-in file converter, multi-protocol support, and other useful functions. Besides, it is said to support FTP, HTTP, HTTPS and Mirrors. Isn’t such description convincing? However, don’t blindly trust the presentation by the developers and supporters. From the perspective of security-minded people, DownloadHunter is an adware and can make your screen flashing with pop-up ads, banner ads, interstitials or even video ads. Also, it can make you browsing/search history, technical information about software/hardware/downloads/uploads, and even some personal details to leak into the hands to suspicious third parties. Thus, think twice before installing DownloadHunter adware! Don’t you find the name DownloadHunter familiar? Doesn’t it remind you of a SpyHunter? It’s like a pun that the developers use to make this browser add-on sound more familiar and arise the feeling that it’s a secure app. Don’t get fooled by this tricky quibble because DownloadHunter adware has nothing in common with SpyHunter unless the fact that one can recognize the other as a PUP and remove quite quickly. If DownloadHunter adware gets into the system, it hijacks web browsers (IE, Chrome, Firefox, Safari) to enable third party ads. Advertising is one of its main tasks since third parties pay for the developers of this application for displaying advertisements that contain links to external websites. Only this way this download manager can stay free of charge. Once the browser is hijacked, it starts generating “Ads by DownloadHunter.” Their frequency may vary depending on how much sponsors the adware has had at the moment you’ve installed it. Anyway, pop-up ads, banner ads, interstitials, in-text links, full-page ads, video ads, and other forms of advertisements are very intrusive. Thus, no matter how many ads you may see at once, they can prevent you from clicking on the original content. Instead of that, you may accidentally click on the commercial and non-commercial ads, what may cause DownloadHunter redirects to third-party websites. Although that may not necessarily happen, keep the fact in mind that you may be rerouted to unsafe websites that promote third-party software or services. Thus, our recommendation would be to remove DownloadHunter virus from your PC right away. For this purpose, try Reimage. While it has the official website, most frequently people fall for installing it via software package. Besides, usually they don’t even understand that. Therefore, the only way to prevent DownloadHunter add-on from landing on your PC’s system against your will is a careful installation of freewares. In other words, you should not skip Advanced/Custom settings unchecked because they can inform about ‘optional components’ and contain unlocked check marks. Thus, it means that seeing or not seeing DownloadHunter ads is up to you. DownloadHunter add-on is the one that tracks its users. It can activate cookies on each of your browsers and start collecting information that is vital to those who do online marketing. According to the recent reports, this adware can collect the following information: browser’s type, language, software/hardware information, downloads and uploads from/to the Internet, search terms, pages viewed, data entered in them, clicks, IP address, email address, etc. If you disapprove of data leakage to third parties, don’t waste your time and remove DownloadHunter virus right away. DownloadHunter removal guide is given down below this post. If you scroll down, you will see that you have two options, i.e. manual and automatic. However, we would like to emphasize the fact that by removing this PUP manually, you may leave some of the components unremoved, which is why after some time you may find DownloadHunter virus restored. That’s why you should remove it using a reliable anti-malware. Here, look for DownloadHunter or any other recently installed suspicious programs. Wait until you see Applications folder and look for DownloadHunter or any other suspicious programs on it. Now right click on every of such entries and select Move to Trash. When in the new window, check Delete personal settings and select Reset again to complete DownloadHunter removal. Once these steps are finished, DownloadHunter should be removed from your Microsoft Edge browser. Here, select DownloadHunter and other questionable plugins. Click Remove to delete these entries. Now you will see Reset Firefox to its default state message with Reset Firefox button. Click this button for several times and complete DownloadHunter removal. Here, select DownloadHunter and other malicious plugins and select trash icon to delete these entries. Click Reset to confirm this action and complete DownloadHunter removal. Here, select Extensions and look for DownloadHunter or other suspicious entries. Click on the Uninstall button to get rid each of them. Now you will see a detailed dialog window filled with reset options. All of those options are usually checked, but you can specify which of them you want to reset. Click the Reset button to complete DownloadHunter removal process. This entry was posted on 2015-10-29 at 04:37 and is filed under Adware, Viruses. You can quickly scan the QR code with your mobile device and have DownloadHunter manual removal instructions right in your pocket. How did you remove DownloadHunter?